PEPPERS CELEBRATES 1ST BIRTHDAY ON THE GOLD COAST - AND YOU'RE INVITED TO THE PARTY! Peppers Broadbeach – the property that brought five star accommodation back to the Gold Coast – is turning one and inviting guests to stay and celebrate summer in style. The special Peppers Broadbeach 1st birthday package combines quality time with the family, with your partner and with yourself and includes: a 30 minute Clarity Massage for two people at Endota Day Spa*; a 3 hour child-minding service to give Mum and Dad some 'kid-free' time *; complimentary bike, beach and board game hire for the whole family to enjoy; complimentary in-room movies and internet for two nights so you stay connected and a complimentary upgrade to a Two Bedroom Ocean Suite for even more space and comfort and breathtaking views of the Pacific Ocean. The package is priced from $405 per night on a minimum 2 night stay. For bookings contact 1300 987 600 or visit www.peppers.com.au/broadbeach. Peppers Broadbeach has done things differently to other apartments on the Gold Coast by setting the benchmark for personalised customer service. From the iPad check-in and service by concierges fitted with mobile iPads, a mini-bar with a focus on local and organic products and free WiFi throughout the hotel, acknowledging guests needs to stay connected whether staying for business or leisure. It is for these reasons, combined with the superb level of service, friendly staff and exceptional design and decor that in just one short year, Peppers Broadbeach achieved the Number 1 ranking on TripAdvisor for accommodation in Australia. "Peppers Broadbeach is a stunning example of how the Peppers brand can work in metropolitan locations. It has surpassed all expectations and provided us with an excellent platform to launch further CBD properties under the Peppers brand over the next 12 months," said Mantra Hotel Group CEO, Bob East. 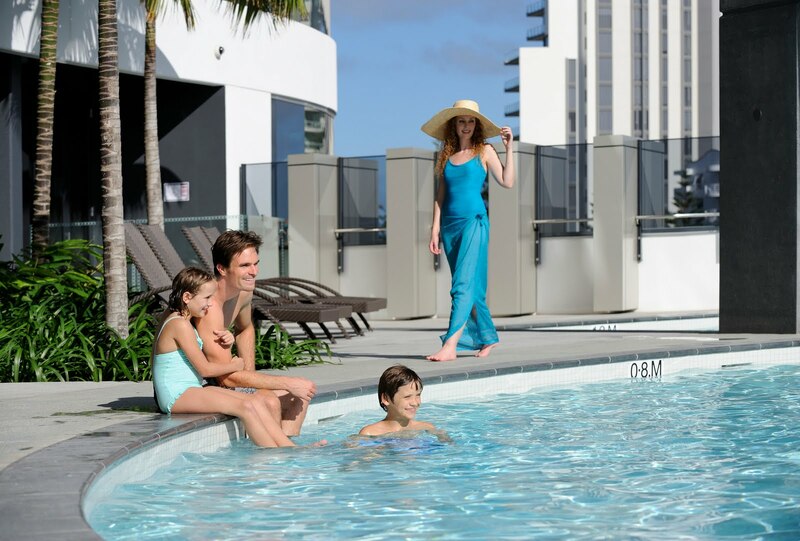 The architectural design of the property's two towers provide a dramatic landmark on the Gold Coast skyline, and feature extensive use of life spaces including Zen gardens, tai chi lawns, private cinemas, guest lounges, teppanyaki barbeques, steam rooms, saunas and lap, plunge and resort pools, and housing 505 one, two and three bedroom apartments. 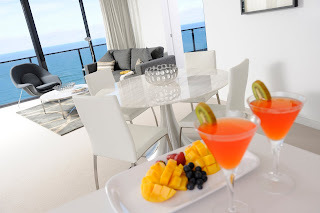 For a truly unique Gold Coast experience, stay with Peppers in the heart of cosmopolitan Broadbeach –a fusion of city sophistication and coastal relaxation where the Coast's premier dining and cafe scene complements an ideal beachside location. Peppers Broadbeach is located cnr Surf Pde & Elizabeth Ave, just a short stroll to beautiful Kurrawa Beach and parklands; a 25 minute drive from Gold Coast airport and a 40 minute drive to the hinterland. * Offer is valid until 31 March 2012, subject to availability and blackout dates apply. Endota day spa massages and child minding service applicable once per stay. Aussie icon and Mantra hotel ambassador, Pat Rafter has made some prime picks for surf and city getaways this summer at Australia's most sought-after holiday locations from the tropics of North Queensland to historical Tasmania, coastal NSW to the wild west of WA - and everywhere in between! Now is the ideal time to book your great Australian summer holiday with Pat's Mates Rates on offer at a variety of spacious Mantra apartments and hotels throughout Australia, valid for stays until 31 March 2012*. The balmy beaches of Tropical North Queensland are a bargain-hunters dream where a 'Stay 3, Pay 2' special applies. Rates start from just $140* per room per night at Mantra Esplanade, Cairns with more '3 for 2' night deals also on offer at Mantra Amphora, Palm Cove from $160* per room per nights and popular Port Douglas resorts from $150 per night including Mantra PortSea, Mantra on the Inlet, Mantra in the Village, Mantra Heritage and Mantra Aqueous on Port. More great value 'Stay 3, Pay 2' deals can be found across leading Australian leisure destinations including Mantra on Salt Beach at Kingscliff in Northern NSW from $217* per night, Mantra Mooloolaba Beach on the Sunshine Coast from $198* per night, Mantra Hervey Bay from $140* per night and Mantra Erskine Beach Resort in Victoria's summer haven of Lorne from $179* per night. The holiday mecca of the Gold Coast provides both an action-packed family getaway or a much needed escape to relax and rejuvenate. Stay in luxury in the heart of Surfers Paradise at Mantra Circle on Cavill from just $176* per room per night in a One Bedroom Spa Apartment or enjoy the cosmopolitan coastal charm of Broadbeach at Mantra Bel Air from $120* per night in a One Bedroom Apartment. Alternatively holidaymakers can follow the bright lights to the big cities for cultural encounters, a cosmopolitan vibe and endless entertainment with these sizzling Pat's Mates Rates. Guests can enjoy the delights of Sydney from $165* per night in a Studio Room at Mantra Parramatta, the buzz of Brisbane from $135* per night in a Hotel Room at Mantra on Queen, the magic of Melbourne from only $179* per room in a One Bedroom Apartment at Mantra 100 Exhibition, the historical sites of Hobart from $141* per night in a One Bedroom Apartment at Mantra One Sandy Bay Road or the relaxed pace of Perth from $159* per night in a Queen Studio at Mantra on Murray. 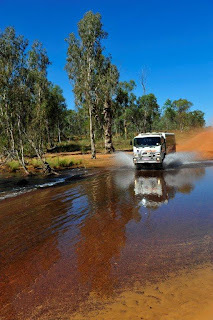 For more great deals and to book call 13 15 17 or visit www.mantra.com.au. *Subject to availability. Block-out dates and minimum night stays apply. Valid for sale and travel until 31/03/2012. The International Cricket Hall of Fame in Bowral is gearing up to open the new Bradman Gallery in late November 2011. Set on the historic Bradman Oval, the very ground where the late Sir Donald Bradman honed his cricketing skills, the new Bradman Gallery will be the centrepiece of the International Cricket Hall of Fame which is a magnet for Cricket Tragics and sports fans alike. "The Bradman Gallery underpins the International Cricket Hall of Fame and we are thrilled that we can take the Bradman story to a new level and introduce new audiences to the incredible achievements and legacy of Sir Donald Bradman" said Museum Curator, David Wells. The new gallery will showcase items from the Bradman Museum that have never been on display before integrating low and high tech interactive technology to tell the story of 'The Boy from Bowral' and his incredible achievements both on and off the field. "The International Cricket Hall of Fame goes from strength to strength and opening our relocated and expanded Bradman Gallery gives visitors yet another reason to visit the museum" commented Rina Hore, Bradman Foundation Executive Director. Other elements of the new Bradman Gallery include a dedicated Bodyline Theatrette, a new interactive Tank Stand display, an interactive Bradman letter trail from 1926 to 2000 and the first ever display of Sir Donald's presentation coaching slides, shown in context and replicating his own presentations. Priceless pieces such as Sir Donald's first cricket bat and a selection of his baggy green caps will be on permanent display. · 1949 Knighted, the only Australian cricketer ever to receive a knighthood and the first Test cricketer so honoured. · 1979 received a Companion of the Order of Australia. · 1988 Voted the greatest male athlete of the past 200 years by the Australian Confederation of Sport. · Selected as one of only two Australians by International Who's Who top 100 people who have done the most to shape the 20th century. · Nominated among the Top Ten sportspeople of the 20th century by the World Confederation of Sport. · 1999 Named Male Athlete of the Century by the Sport Australia Hall of Fame. · Ranked the No.1 Australian Athlete of the 20th Century by Sports Illustrated magazine. · In 2000 he was voted the greatest cricketer of the 20th century by Wisden Cricket Almanack in a unanimous decision of the 100 judges. If you want to take on a couple of Queensland's best golf courses, and see how the pros do it, too, then you have just a few days left to book a seat on Queensland Rail Travel's Ultimate Rail and Golf Package for 2011. 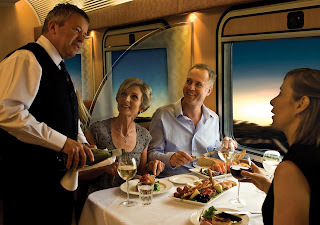 This package is another example of Queensland Rail Travel designing themed events for customers, following on from its sold-out food and wine MasterClass journey. The only driver passengers will need is the one you pull out of your golf bag on the first tee at Hamilton Island Golf Club, as Queensland Rail Travel looks after all transport needs, whether it be by train, plane, or boat. The fly-train-drive-chip-putt package will take customers to three of Queensland's most prestigious golf courses, accommodate them at two stunning locations, before they get to rub shoulders with some of the biggest stars in Australian golf at the PGA Championship. Queensland Rail Travel General Manager, Max Kruse, said the trip is an opportunity of a lifetime for golfers of all standards. 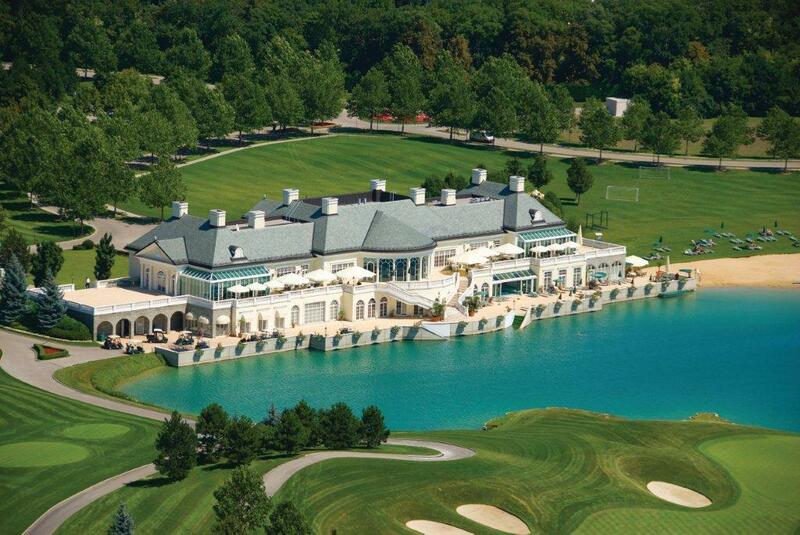 "Special packages like this don't come up very often, so if you want to put your game to the test on two of the best layouts in the country, then you had better get in quick," Mr Kruse said. "After flying in to Proserpine and staying the night at Airlie Beach, we're going to whisk the group across to Hamilton Island. It's then a short ferry ride over to the picturesque course on Dent Island, not much more than a five-iron across the water. "This is the only championship island golf course in Australia, so it really is a unique experience. From there, players and their partners can swap their spikes for something more sophisticated, with an overnight journey to the Sunshine Coast, travelling and dining in Queenslander Class on The Sunlander. Mr Kruse said there will be even more time for customers to relax when they step off The Sunlander. "Golfers don't normally like being in the sand, but we're going to put them up on the water's edge at Mantra Mooloolaba Beach for three nights. "We've also managed to wedge in a day at the Australian PGA Championship at Hyatt Coolum. "There's an amazing field lined up for the event. Our tour group will get to see some big Australian names in action like Greg Norman, Adam Scott, Jason Day and Geoff Ogilvy, playing alongside visiting major-winners such as Y.E. Yang and Darren Clarke. "I hope some of pros' skill rubs off on our players, as they finish the trip with 18 holes at the Greg Norman-designed Pelican Waters Golf Course. After handing in their cards, passengers reach the 19th hole – Roma Street station – with a short trip home on the Tilt Train. Seats are limited, and on sale until October 28, with a departure date of November 23. The five-night package includes all travel, transfers, accommodation, green fees, and a ticket to the Australian PGA Championship for just $1719 per person twin share (ex-Brisbane/Gold Coast). Buckingham Palace has been drawn into an international mystery and is endeavouring to validate the authenticity of a 100 year old oak tree growing at Accor Vacation Club's Grand Mercure Basildene Manor in Margaret River WA. One hundred years ago in 1910 Percy Willmott, his wife Margaret and their three children left Fremantle port for a two month voyage to Percy's homeland England whilst their manor was being built in WA. Percy planted the acorn at the front of Basildene Manor hoping to shade their new home, outside their bedroom window. This European sapling, struggled to grow in unforgiving soils and sweltering summers, out of place, amongst the stands of jarrah, karri and gum trees on the 14 acre property. But survive it did. Today, the majestic oak tree currently stands 32 metres tall and is still a favourite place for staff and guests to sit under, when visiting the world famous wine growing region 3.5 hours from Perth. 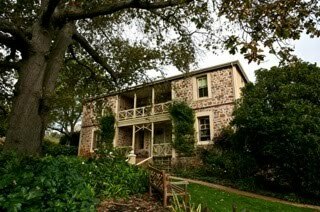 The property was classified in 1978 by the National Trust of Australia as a significant heritage property, and listed with the Heritage Council of Western Australia in Sept 1991. Of course Customs would frown upon such activity today, but photos of the WA tree are being compared to the famous oak tree at Buckingham Palace by head gardener Mark Lane, who is assisting Accor Vacation Club (owners of the manor) to ascertain if the "tall tree tale" is indeed correct, as they are set to celebrate the 100th birthday of the historic Hotel, in early 2012. The lush gardens are now very well established, with trees, natives and herb & vegetable gardens, some of these featuring throughout the properties lounges and even make it onto the plates of the well known "Basildene breakfast." A luxurious lounge and bar from a bygone era is nestled below the majestic sweeping staircase, and modern comforts abound in the Manor House, loved by locals and tourists alike, in a convenient position on the outskirts of Margaret River township, close to all the wineries and tourist attractions. Dozens of cute wallaby joeys have emerged on the newly opened Wallaby Walk at Moonlit Sanctuary on the Mornington Peninsula, just as this award-winning wildlife conservation park celebrates its 10th birthday. The 250 metre-long Wallaby Walk is home to around 80 wallabies and kangaroos which live in a natural bush environment, but are tame enough to hand-feed. To celebrate Moonlit's birthday – and those of the new joeys – visitors until November 17 will be given a free bag of special wallaby food so they can feed the wallabies and watch the joeys poking their heads out of their mothers' pouches. "It's quite a sight," says Chief Ranger Michael Johnson. "The joeys perform some great antics as they wriggle around inside the pouches then suddenly pop their heads up or stick their legs out at very amusing angles." Inspired by the work of famous British conservationist Gerald Durrell, Moonlit Sanctuary is now home to 50 Australian species, some rare and endangered, which live in 10 hectares of bushland. Visitors who plan to experience more of the Peninsula get the best value through the Mornington Peninsula Attractions Pass, which saves up to 45% on admission and bonuses at four attractions and includes discount offers at three more. The pass costs only $55 for adults (more than $100 full retail value), $40 for children, and can be purchased at www.emmp.net.au or at any participating attraction. 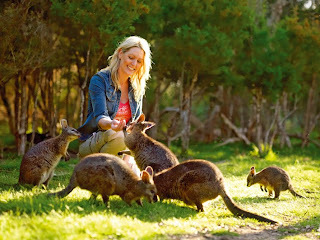 The Attractions Pass provides entry to Moonlit Sanctuary Wildlife Conservation Park with a koala cuddle, Ashcombe Maze and Lavender Gardens, Cape Schanck Lighthouse, and Peninsula Hot Springs. Sunny Ridge Strawberry Farm, Box Stallion Winery and Rye Hotel all have a special 10% discount offer for pass holders. Pass holders can also upgrade to the lantern-lit evening tour at Moonlit Sanctuary, when the park comes alive in a remarkable way. Owls and other night birds are active, tiny feathertail gliders and giant yellow-bellied gliders swoop around, and rare and endangered species such as quolls, pademelons and bettongs forage for food. Moonlit Sanctuary won the 2010 Victorian Tourism Award for Ecotourism. It was also voted Victoria's best wildlife park experience in the 2009 RACV survey to find Victoria's 101 best tourism experiences. Contacts: www.moonlitsanctuary.com for free food voucher; www.emmp.net.au for Attractions Pass. 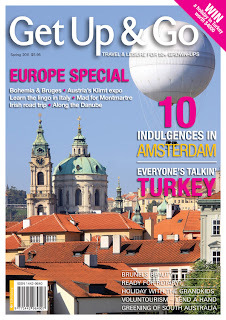 Get Up & Go magazine, Australia's premier travel magazine for grown-ups – 55 years and over - has just released its spring edition. Planning for Europe now or in the near future? 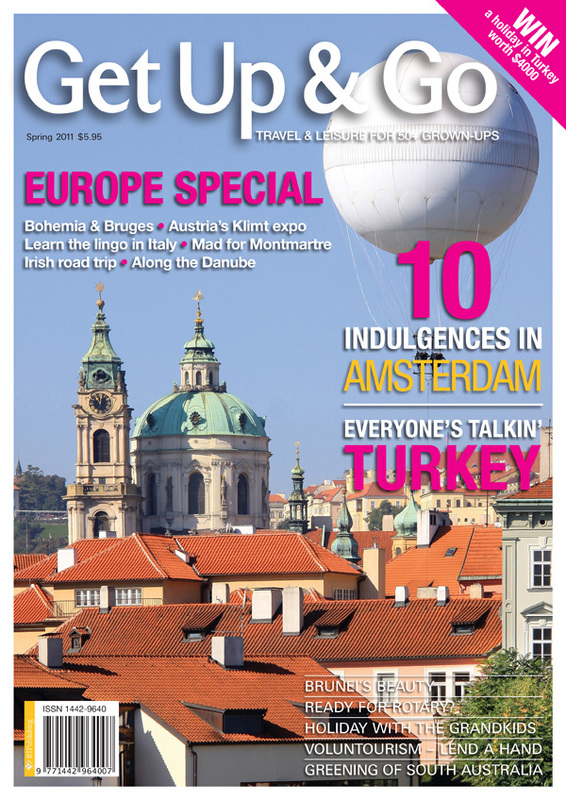 We've got some great places covered – cruise the Danube; get arty in Montmartre; learn the lingo in Italy; visit spicy Istanbul; tiptoe through tulips in Amsterdam; go Bohemian in Eastern Europe and find out just what Bruges is all about. We take you on a road trip in Ireland, a volunteering holiday in Thailand and we advise you on spending your kid's inheritance on the grandkids! Full of flavour, fun, insight and inspiration – this big fat issue of Get Up & Go will get you going. Also WIN a marvellous holiday in Turkey – it can't get much better. The again, maybe it can – head to the Mornington Peninsula in Victoria, some glamour caves in Western Australia and a revitalised landscape in South Australia where the Murray has been well and truly 'topped up' after the rains. In celebration of the Peppers partnership with MasterChef Series 3, Peppers Coorabell Retreat in the peaceful Byron Hinterland is staging a two-night cooking discovery using the region's finest seasonal produce. Designed and hosted by Head Chef Adam Hall and Leah Roland from the Bangalow Cooking School, the MasterChef inspired Culinary Experience and Food Education Package will be held November 2-4. The package includes two nights twin-share accommodation, full breakfast daily, three-course dinner at Wilson's by the Creek, hosted local market tour and cooking school with three-course dinner and Foodscapes farm tour plus a take-home copy of the MasterChef Series 2 cookbook and a MasterChef apron. Priced from $749* per person twin-share, the package will commence on Wednesday afternoon with a kitchen skills class, followed by a discussion of the ingredients and the cooking style of the evening meal at the picturesque Wilson's by the Creek restaurant. After breakfast on Thursday morning, guests will accompany Chef Hall and Leah to the local farmers market to source the finest seasonal regional produce. 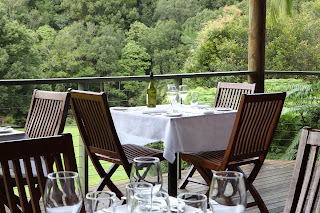 Then it's back to the retreat for a lunch of gourmet sandwiches and to prepare a three-course dinner. During the cooking class, guests will unlock secret processes and techniques to preparing and cooking seasonal produce plus they'll have the chance to discuss all things food – taste, smell, colours and textures, sauces and accompaniments with Chef Hall. To complete the ultimate foodie escape, guests will then be met by local tour guide Karen of Foodscapes and continue the discovery of the region with a tour of local farms and lunch along the way. Peppers Coorabell Retreat is located just 20 minutes from Ballina, an hour south of Gold Coast Airport and two hours south of Brisbane's Domestic and International Airports. Call 02 6684 7348 or email coorabell@peppers.com.au. Leading family-owned cruise line MSC Cruises has unveiled an exciting 22-night package which includes a19-day continent-to-continent voyage from vibrant Rio de Janeiro to romantic Venice. 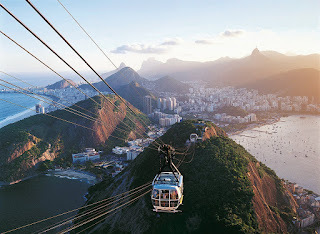 Priced from $4573 per person, twin share, the hot fly/stay/tour/cruise holiday - from March 14, 2012 - includes economy class flight with Emirates from Sydney, Melbourne, Brisbane and Perth with two nights' accommodation in Rio's Copacabana. A guided tour which focuses on the dominating 710-metre high peak Corcovado with its famous statue of Cristo Redentor or "Christ the Redeemer" and Sugar Loaf Mountain is followed by the cruise aboard MSC Musica, including calls on fascinating Brazilian ports Santos, Ilha Grande and Salvador. After crossing the Atlantic, the luxury ship will call on Tenerife, in the Canary Islands, as well as Spain's Malaga, Palma in the Balearic Islands and Malta's Valletta before reaching Venice. "It's a holiday of a lifetime," said Lynne Clarke, managing director of MSC Cruises (Australia and New Zealand), "at a price well below that you would expect to pay if you stayed in each of the ports," she added. 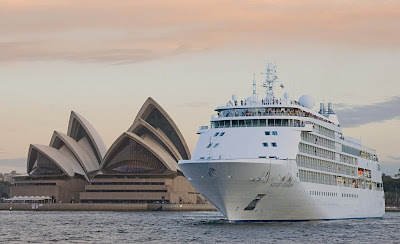 "When you consider all the inclusions and the fact that you are able to enjoy beautiful ports in Brazil and the Mediterranean in one holiday this package is sure to arouse much interest among Australian cruise fans." Also included in the price are transfers, all main meals and entertainment while on board the ship, gala dinners and a captain's cocktail party, port charges and airport taxes and fuel charges. (Tour duration for travellers from Melbourne and Brisbane is 23 days due to return flight arrival the next day). As with all cruises aboard MSC Cruises ships, children under 18 years cruise free when they share a cabin with two adults (pay only port charges).